While Vivo made a big splash yesterday with its launch of the Vivo X6 and Vivo X6 Plus, the manufacturer was more subtle about introducing the Vivo Y51. The device, which recently received certification from TENAA, has been added today to Vivo's website, revealing the complete specs of the phone while also showing off numerous photos of the handset. 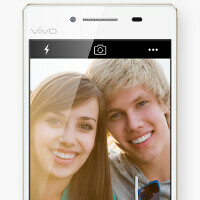 The Vivo Y51 features a 5-inch display with a 540 x 960 (qHD) resolution. The Snapdragon 410 chipset is under the hood, carrying a quad-core 1.2GHz CPU and the Adreno 306 GPU. 2GB of RAM is inside, along with 16GB of native storage. Those requiring additional memory can access the 128GB capacity microSD slot. Dual SIM capabilities are included. The camera combo on the Vivo Y51, from back to front, weighs in at 8MP/5MP. A 2350mAh battery keeps the generator humming, and Android 5.0.2 is pre-installed. The phone supports 4G LTE, 3G, 2G Wi-Fi, Bluetooth, USB, GPS and infrared connectivity. Available in white, the device measures 7.52mm thick and tips the scales at 157 grams. Pricing and availability are not posted on the site yet, so if the Vivo Y51 is your cup of tea, you'll have to await further action by Vivo. qHD should not exist in 2015 going to 2016. Not even in low end? It's not like you're going to get it regardless.